Pickleballers from DeSoto County include Cross Creek’s winning doubles pair, Gisele (Grasshopper) Boyes (center) and her (60-64 bracket) doubles partner Alex Pavao. Heartland Senior Games are hosted by South Florida State College and run through the month. Cross Creek’s Apolo Starr lining up a shot. His partner was Sandy Williams. Charlebois brothers Andre and Jacques play in the 60-64 age bracket. Marcel Marquis partnered with Frank Rossano. Pavao and Boyes crushed the competition in doubles play. Some 120 pickleballers on Saturday dinked balls over the net gently, playing a finesse game, or drilled them at their opponents feet in a power game in the Heartland Senior Games doubles pickleball tournament. Forty-two women and 84 men competed in five-year age brackets, from 50 to 54 up to 80 to 84. DeSoto County was well represented at the competition. A large contingent of spectators was on hand from start to finish, watching some exciting action on the courts at Tanglewood in Sebring. The day started out fine but a blast of chilly air soon blew through. When the clouds lifted there were strong winds which played havoc with the lightweight plastic pickleballs. Fortunately, the rain held off until the final match of the day. The doubles pickleball tournament, the largest event on the Heartland Games calendar, attracted players from Arcadia, Lake Placid, Sebring, Avon Park, Frostproof, Lakeland, Kissimmee, The Villages and beyond. The Arcadia contingent, all from Cross Creek RV Resort, had Andre and Jacques Charlebois plus Bill Monnon and Alex Pavao competing in the men’s 60 to 64 year old group. Frank Rossano and Marcel Marquis, as well as Sandy Williams and Apolo Starr, played in the 70 to 74 age bracket. The Charlebois brothers lost in round one, moving them into the consolation bracket where they won their first game, 16-14, against a team from Tanglewood. They then met up with a tandem from Sun n Lake, Sebring, and were knocked out of the tournament, losing 15 to 9. Bill Monnon and Alex Pavao formed a strong partnership that carried them to a bronze medal. In the first round they defeated a team from Frostproof, 11-6, 11-4. In round two they won the first game, 11-2, then lost a close one, 14-10, before taking the victory over their opponents from Sun n Lake, 11-2. Round three saw them pitted against a pair from Lakeland where they suffered their first loss of the day, 13-11 and 11-6, to the eventual gold-medal winners. This put them into a battle with the tournament’s silver medalists which they lost, 15-6. Sandy Williams and Apolo Starr played all three of their matches against teams from the host Tanglewood. After moving to the consolation round, they won their first game, 15 to 11, but were knocked out of play with a 15-7 loss in the next game. Frank Rossano and Marcel Marquis also faced teams from Tanglewood, losing in the first round with scores of 11-5 and 12-10. Second round play saw them eliminated after losses of 11-5 and 11-3. On Sunday, fifty mixed-doubles teams took over the courts, with both temperatures and competition heating up considerably through the day. Once again, wind played a factor in the games. Two of the men from Cross Creek returned with female partners to compete in mixed doubles. Bronze-medal winner from Saturday, Alex Pavao, returned with his partner Gisela (Grasshopper) Boyes, and the defending tournament champions didn’t disappoint their fans. Frank Rossano was also back with Louise Vermette at his side. In the first round, Vermette and Rossano met up with a team comprised of a man from Tanglewood and a woman from The Villages who is a veteran of numerous competitions across the nation. The locals lost both games and moved to the “opportunity” bracket where they lost a hard fought battle, 15-11, against a duo from Avon Park. Boyes and Pavao traveled a long path to get to the championship game in their 60-64 age group. They started off with a two-game win in the first match against a team from Buttonwood Bay, Sebring. That was followed by another straight-set victory over a tandem out of Lake Ashton in Lake Wales. The third round pitted them against last year’s silver medalists, but the locals dominated with wins of 11-7 and 11-2 over the Tanglewood pair. Next up was a team from Avon Park that went on to take the bronze medal. This was the first real challenge of the day, but Pavao and Boyes came out on top with a 13-11 loss, combined with wins of 12-10 and 11-7. On to the gold-medal match against the Sebring duo they had destroyed in round three. Once again, the Cross Creek couple crushed the competition with convincing wins of 11-6 and 11-2. 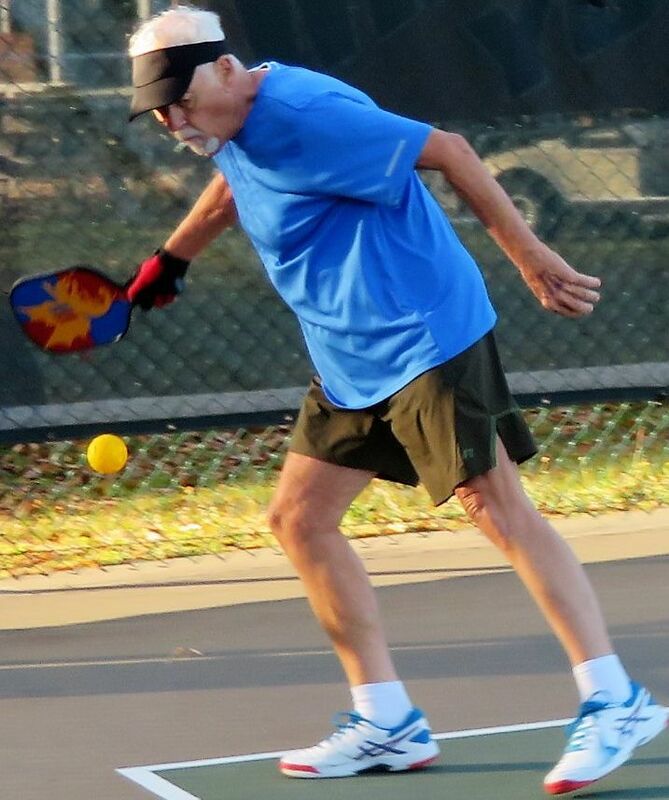 Pickleball is reported to be the fastest growing sport in North America. In Highlands County it has taken off like wildfire in the past few years with several communities installing courts. Cross Creek has an active program and other DeSoto communities are sure to find a need to build courts in the near future to meet the demand. If you have never seen a game of pickleball, you must do so. It is played on a smaller court than tennis and is much faster paced. Those who try it are quickly addicted.